Dedicated to the ship's company of La Moqueuse, this book is not so much an account of naval operations as a kind of social history. 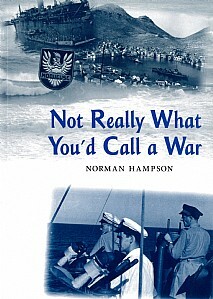 With the help of recollections, diaries and letters home, it recreates the reactions of an undergraduate to his various reincarnations as an ordinary seaman in a corvette, the most junior officer on board a destroyer and the British naval liaison officer in a Free French sloop. Roughly half of the book deals with the very special atmosphere in the Free French forces and the complex situation in southern France immediately after its liberation in August, 1944. The volume as a whole provides a vivid impression - occasionally reminiscent of Catch 22 - of what it actually felt like to be involved in the day-to-day experience of helping to make a warship work.